A police car swerved onto the sidewalk and struck a pedestrian who suffered two broken legs, police say. A police cruiser swerved onto a sidewalk on Saturday and struck a pedestrian, breaking both of the person's legs, then slammed into a Brooklyn building, the NYPD said. A witness said the police car had swerved to avoid a child who ran in the street. The 32-year-old pedestrian whose legs were broken was taken to Brookdale Hospital, police said. The officers also suffered minor injuries. 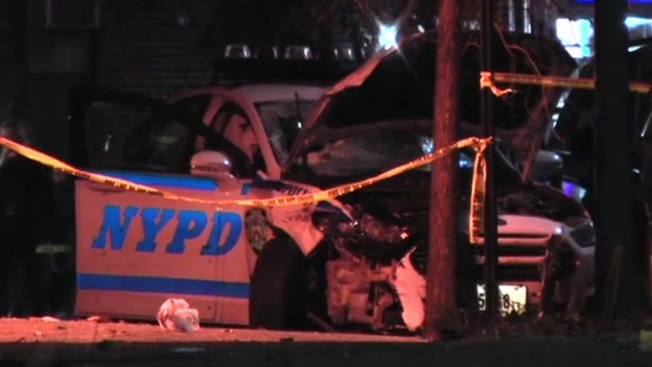 The officers were turning onto Jerome Street from New Lots Avenue in East New York when they went up on the sidewalk, hit a tree and a parked car, then struck the building, police said. Raheime Pinchback witnessed the crash and ran to help the officers. He said he was on New Lots Avenue when he saw the police car making a left turn and a little boy darted in front of the car. Pinchback said the boy's mother was chasing after them and both mother and child got clipped. It wasn't clear if they were injured. He ran to the police cruiser and tried to help the officers, only to see that one of the officers was a friend of his. "When I seen her, I came to tears," Pinchback said. The officers were responding to a report of an active shooter, which turned out to be a false alarm.